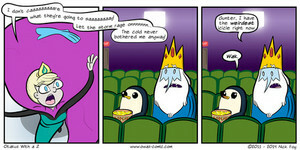 ice king and Queen comic. Read this its funny. Wallpaper and background images in the Adventure Time - Abenteuerzeit mit Finn & Jake club tagged: photo. This Adventure Time - Abenteuerzeit mit Finn & Jake photo contains anime, comic, manga, cartoon, comic buch, karikatur, and comics. There might also be buntglasfenster, glasfenster, glasmalerei-fenster, slot, ein einarmigen banditen, schlitz, ein bewaffneter bandit, steckplatz, spielautomat, münzautomat, slot-maschine, and münzautomaten. Du Like My New Face?